Microchips embedded in pills can ease medicine management and empower patients. Earlier this week, Proteus announced that they have been approved by the FDA to market their ingestible microchips for pills. Generally, the FDA approval process for devices that are totally new like this is a painful one, with much suffering. So it is a big deal for anyone to get approved for anything. But this is a far more important accomplishment than a mere incremental improvement. It is an entirely new kind of medical device and, most importantly, a whole new potential data stream on one of the most critical issues in the delivery of health care. Modern drugs work wonders, but it does not help a patient if the patient does not take them. Historically, and I do mean the stone age here, the ability to consistently take pills correctly has been called “compliance.” But please do not call it that. Most participants in the movement for patient rights regard that term as paternalistic. “Adherence” is a much more respectful term (although I have certainly heard it used in a paternalistic manner). In fact, as we progress, I should define that when I say “adherence,” what I mean is “adherence to a plan that belongs to the patient.” If a pill that I am taking makes me so sick to my stomach that I cannot take it any more, then when I decide to stop taking it, I am not being “non-compliant” or “non-adherent” to a medication plan; I have changed my medication plan, and I have yet to discuss the issue with my doctor. Still, even for patients who want to consistently take their pills according to a plan, it can be extraordinarily difficult. It is hard to remember when a pill has been taken. It is hard to remember to pick up a new supply or to call for a renewal. It is easy to forget pills on trips and run out unexpectedly far from home. 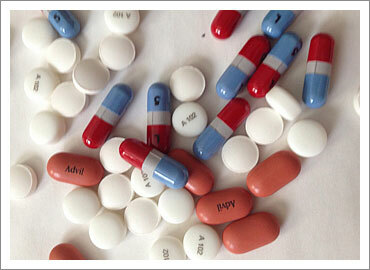 Pills frequently must be taken with food, or without food, or with or without specific foods. They must be taken before bed or before breakfast. Personally, I have trouble remembering to take even a single pill consistently. But many people need to manage a tremendous number of pills, and they frequently go off one set of pills and onto another. 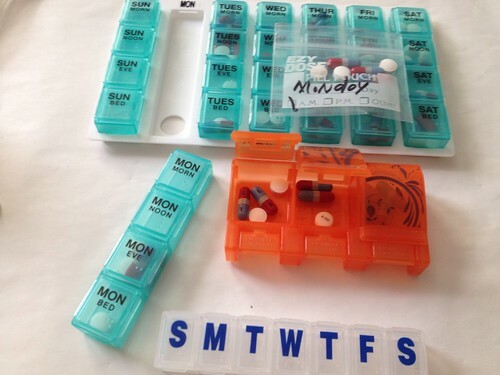 In short, pill management is a huge mess, and it is difficult to organize anything. The Proteus technology allows a person to wear a patch that can detect when any pill carrying a proteus microchip is swallowed. Using that patch and a wireless connection of some kind, it is pretty simple to enable all kinds of clever “take your pill UX.” With this technology, it will finally be possibly to reliably perform “quantified self” on pill regimes. This should not be taken to mean that this technology will be taking the thought out of taking pills. Instead, think of this as a mechanism to enable greater self-knowledge through numbers. Already, Proteus engineer Nancy Dougherty has demonstrated that the technology could revolutionize placebo research. Dougherty’s work is and should be utterly surprising and delightful, and it should also demonstrate that the potential uses for this technology are unlimited. As with any game-changing tech, Proteus will have to make sure it uses its new super power for good. I see no reason at all why they would not be in a position to do that (and yes, I fully recognize that many people will disagree). 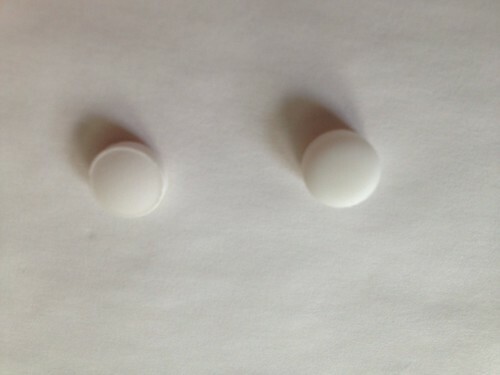 In the following picture, can you tell these pills apart? One is over the counter and one is prescription. Can you imagine trying to sort through these every day? 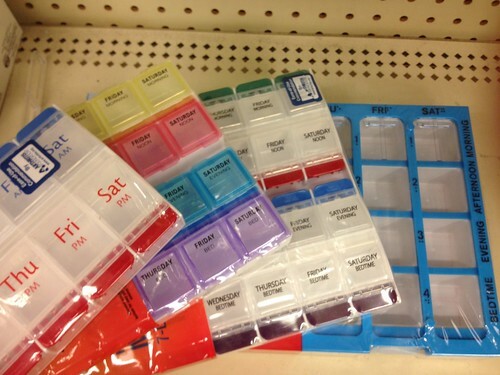 Pictured below are the “big” pill organizers. The one on the bottom is enormous. I think you could cook cupcakes in it. I seriously hope I will never have to use something like that. Note that the ones with the little blue stickers are specifically designed to be easy to open for patients with arthritis. I am releasing these and all of my “pill box flickr set” under the creative commons to mark the Proteus accomplishment. Photo of pills: “Untitled by tr0tt3r, on Flickr.